Some facial injuries from a car accident can be devastating. You can suffer horrific disfigurement and loss of function. A severe facial injury can be catastrophic, both in physical injuries and emotional harm. To discuss your case, call Max Meyers Law at 425-399-7000. Your face hits the dashboard, windshield, back of the seat, door, or some other hard surface or object inside the car. The airbag strikes your face with great force. Flying through the windshield and landing outside of the vehicle can cause facial injuries. The other vehicle or an object outside of your car, like a tree or telephone pole, can collide with your body and cause facial injuries. A jagged object, like glass or metal, cuts your face. Burns: if the car or something outside of the vehicle catches fire or explodes, the face is one of the likely locations for burn injuries. Lacerations: deep cuts to the face can happen whenever something sharp or jagged penetrates the skin. Lacerations can lead to scarring and damages to muscles, nerves, and blood vessels. Eye injuries: from car accidents can be devastating. A person can sustain a ruptured globe of the eye (eyeball), bleeding in and around the eye, damage to the surrounding tissues including muscles that control eye movement, traumatic retinal detachment, and other eye injuries that can cause visual impairment or loss of the eye. Facial fractures: some possible facial fractures are of the nose, sinus, jaw (mandible), and orbital bones (around the eyes). 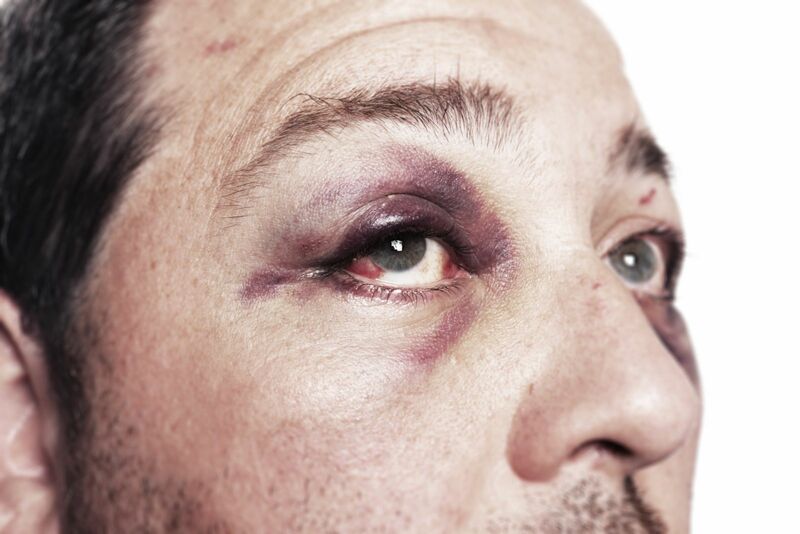 Black eyes are red flags for possible facial fractures. Some facial fractures are life-threatening. Loss of teeth: your teeth can get knocked out in a collision. Sometimes the trauma doctor can replace them. You might heal surprisingly well from dental injuries, or you might need dental implants. Dislocated jaw: can happen in a wreck, depending on the point of impact on your face, the angle at which you held your head, and the direction from which the striking object came. Airway obstruction: might require a tracheotomy for you to breathe following a severe facial injury. Collateral injuries: in a wreck of sufficient force to cause facial injuries, a person can also sustain intracranial injuries, dissection of the carotid or vertebral artery, or a cervical spine injury, all of which can be debilitating if not fatal. You can suffer disfigurement from facial injuries you experience in a car crash. This disfigurement can negatively impact your career opportunities, social life, self-esteem, and enjoyment of life. Economic losses – such as your lost wages and medical expenses. Your medical expenses are all the reasonable medical care you need because of the crash, for example, the ambulance, emergency room, trauma physician, diagnostic testing, surgery, hospital, plastic and reconstructive surgery, physical and occupational therapy, and prescription medications. Non-economic damages - can include your physical pain, mental anguish, depression, loss of enjoyment of life, and your spouse’s loss of consortium. If you sustained a physical injury, you might get an award or settlement including non-economic as well as economic damages. There is a statute of limitations in Washington state for car accidents, so it is important to contact an attorney as soon as possible after a car accident. We will walk you through every step of the process, from collecting evidence to deciding if you should settle or pursue a lawsuit. Get a free case evaluation; call us at 425-399-7000. We will not charge attorney fees until you win.